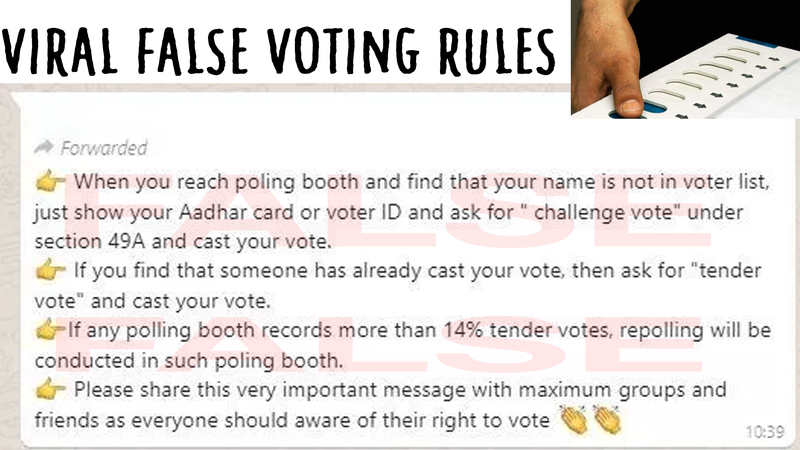 A message about voting is viral on Whats app with three claims. “👉 When you reach poling booth and find that your name is not in voter list, just show your Aadhar card or voter ID and ask for ” challenge vote” under section 49A and cast your vote. 👉 If you find that someone has already cast your vote, then ask for “tender vote” and cast your vote. 👉If any polling booth records more than 14% tender votes, repolling will be conducted in such poling booth. V IMP : 1/2 👉 When you reach poling booth and find that your name is not in voter list, just show your Aadhar card or voter ID and ask for " challenge vote" under section 49A and cast your vote. Election Commission(EC) officials replied to SMHoaxslayer’s query on Twitter who claimed that claim 1 and claim 3 are false while claim 2 is true. According Election Commission’s handbook for presiding officers , it has been mentioned that the first presiding officer will establish the identity of the elector with the help of the electoral photo identity card issued by ERO. Below is the screenshot of EC’s handbook. Claim2: “If you find that someone has already cast your vote, then ask for “tender vote” and cast your vote”. According to Basu , this claim is true . The EC’s handbook also mentions that the presiding officer has the authority to tell the voter to cast his vote in ballot paper if he/ she finds herself that his/her vote has been casted. Source : Election Commission handbook for Polling Agents . Here is the twitter link of Election Commission of India. Anyone whose name is not on the Voters' List can not vote. On 5 April , Dr SY Qureshi former Election Commissioner of India has tweeted his views regarding the wats ap message that went viral. Here is the twitter link of Dr SY Qureshi and below is the screen shot of the tweet. That’s a fake message ! ← No! The Gujarat Government has NOT cancelled Good Friday Holiday. Tweeples took a joke quite Seriously ! Did Saudi TV censored Hair of Angela Merkel for lack of Headscarf ? Laughing Colours, Back Benchers, Indian Citizen, all pages using fakes for popularity ! Kamal Nath used a Bangladesh photo claiming BJP as corrupt. October 16, 2018 Hoax Slayer Comments Off on Kamal Nath used a Bangladesh photo claiming BJP as corrupt.